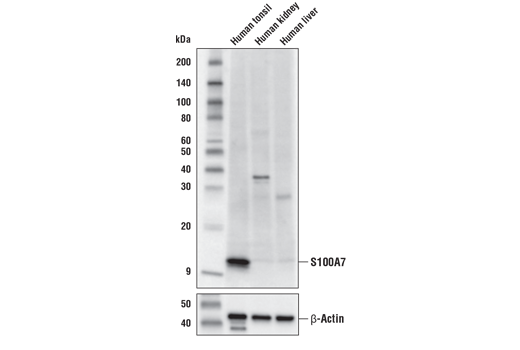 Western blot analysis of extracts from human tonsil, kidney, and liver tissues using S100A7 Antibody (upper), and β-Actin (D6A8) Rabbit mAb #8457 (lower). Mouse Anti-rabbit IgG (Conformation Specific) (L27A9) mAb (HRP Conjugate) #5127 was used as a secondary antibody. As expected, extracts from kidney and liver were negative or low for S100A7 expression. S100A7 Antibody recognizes endogenous levels of total S100A7 protein. Polyclonal antibodies are produced by immunizing animals with a synthetic peptide corresponding to residues near the amino terminus of human S100A7 protein. Antibodies are purified by protein A and peptide affinity chromatography. Despite their relatively small size (8-12 kDa) and uncomplicated architecture, S100 proteins regulate a variety of cellular processes such as cell growth and motility, cell cycle progression, transcription, and differentiation. To date, 25 members have been identified, including S100A1-S100A18, trichohyalin, filaggrin, repetin, S100P, and S100Z, making it the largest group in the EF-hand, calcium-binding protein family. Interestingly, 14 S100 genes are clustered on human chromosome 1q21, a region of genomic instability. Research studies have demonstrated that significant correlation exists between aberrant S100 protein expression and cancer progression. S100 proteins primarily mediate immune responses in various tissue types but are also involved in neuronal development (1-4). Each S100 monomer bears two EF-hand motifs and can bind up to two molecules of calcium (or other divalent cation in some instances). Structural evidence shows that S100 proteins form antiparallel homo- or heterodimers that coordinate binding partner proximity in a calcium-dependent (and sometimes calcium-independent) manner. Although structurally and functionally similar, individual members show restricted tissue distribution, are localized in specific cellular compartments, and display unique protein binding partners, which suggests that each plays a specific role in various signaling pathways. In addition to an intracellular role, some S100 proteins have been shown to act as receptors for extracellular ligands or are secreted and exhibit cytokine-like activities (1-4). S100A7, a member of the S100 family, lacks a calcium binding site in the N-terminal EF-hand domain. It is also known as Psoriasin, due to its involvement of hyperproliferative disorders of the skin (5). Several members of the S100 family have been reported to play a role in tumor progression, angiogenesis, and metastasis (6). S100A7 expression has been shown to be increased in several different types of cancer including lung, breast, skin, head and neck, stomach, ovary, and others (7-10). Overexpression correlates with poor prognosis, and in some tumors promotes metastasis (11,12). The pro-tumorigenic properties of S100 proteins, including S100A7 may make them attractive candidates for therapeutic intervention (13). Heizmann, C.W. et al. (2002) Front Biosci 7, d1356-68. Donato, R. (2003) Microsc Res Tech 60, 540-51. Marenholz, I. et al. (2004) Biochem Biophys Res Commun 322, 1111-22. Santamaria-Kisiel, L. et al. (2006) Biochem J 396, 201-14. Ekman, A.K. et al. (2017) Acta Derm Venereol 97, 441-8. Chen, H. et al. (2014) Am J Cancer Res 4, 89-115. Zhang, H. et al. (2007) Lung Cancer 57, 37-45. Al-Haddad, S. et al. (1999) Am J Pathol 155, 2057-66. Tripathi, S.C. et al. (2010) PLoS One 5, e11939. Wang, C. et al. (2019) Pathol Res Pract 215, 127-36. Mayama, A. et al. (2018) Cancer Sci 109, 3350-9. Lin, M. et al. (2018) DNA Cell Biol 37, 491-500. Padilla, L. et al. (2017) Oncogene 36, 6749-61.